Is there anything more glorious than walking in to a Tabanco, taking large gulps of manzanilla and eat boquerones to the tunes of Camaron de la Isla? I would’t think so! Welcome to the world of Sherry and the Jerez region! Bodegas Baron dates back to 1805, but the oldest solera has traces of 400-year-old wine in it. This bodega was bought in 1985 by Enrique Perezs grandfather. The history of this family and Bodega is pretty unusual in the region. Enriques grandfather, locally called ‘Xixarito’-which means little pea, was an orphan. With no money in his pocket he started to do various and hard labour work already as a kid. But all the time dreaming of making sherry. As an adult he managed to slowly save some money by making a business out of recycling iron from a junkyard. This nickname of his comes from that he only ate peas for a long period because that was what he could afford and he was seen as the ‘begger’ of the village. So when his iron industry started to run well and he managed to sell it to buy this bodega – the people of Sanlucár was chocked. Enrique, together with his uncle and their team are working hard to get the best out of farming, vinification and blending. Bodegas Baron have their own vineyards – 30 hectares on Albariza soil just outside Sanlucár de Barrameda. They are farming everything themselves as well as making the wines. That’s pretty rare in this region where the bodegas usually buys the ’mosto’ (already chaptalized Palominowine) from the winegrower and ’just’ takes care of the aging and blending. 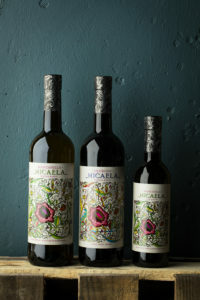 The Micaela wines, which name comes from Enriques grandmother are younger and more fruit driven with high drinkability. 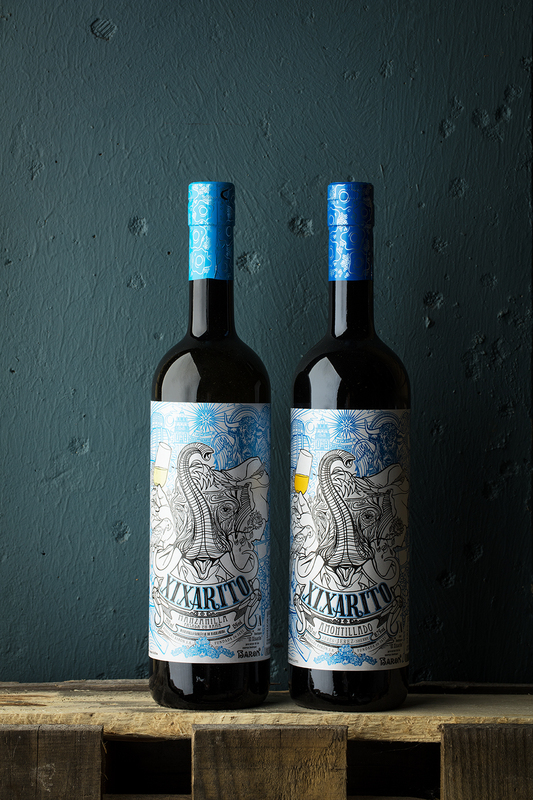 The Xixarito comes from semi-old soleras and offers more depth and complexity – the namne Xixarito is of course an homage to Enriques grandfather. The Soluqua wines are the oldest, most complex ones-wines for reflection. The name is slang for Sanlucár. Vinification: Direct press and then fermentation and fortification to 15%, after that it ages under flor in solera for 4 years. A light filtration takes place before bottling. Vinification: Direct press and then fermentation and fortification to 15%, after that it ages in solera as a fino/manzanilla (under flor) for 5 years, before they inoculate again to reach 17,5% and kill of the flor. So it gets around two years with oxidation to achieve the perfect balance of both freshness and complexity. Vinification: Direct press and then fermentation and fortification to 17,5%, after that it ages in solera without flor for 5 years. The high alcohol level from the start prevents the creation of flor and the result is a nutty, complex drink. 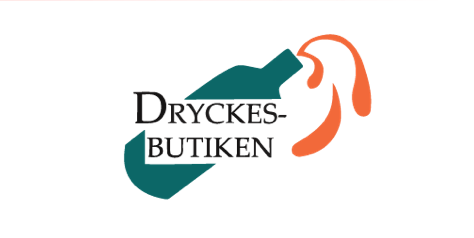 Vinification: Direct press and then fermentation and fortification to 15%. After that it ages in Solera under flor for 5 years, before the flor dies off naturally, and the wine is kept in contact with air for 20 more years of ageing. 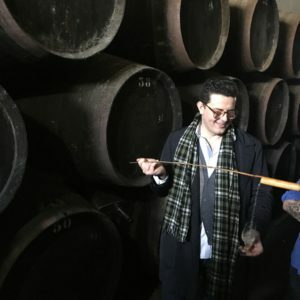 A Palo Cortado is always created by nature, it’s very similar to an Amontillado in the way that it starts it’s ageing under flor, and then continue to age without-but with Amontillado that is created by the addition of alcohol and with the Palo Cortado it just occurs naturally. A very complex, deep but still elegant sherry. Vinification: This is a mix of 70% Micaela Oloroso and 30% Micaela PX that they blend just before bottling. The PX is a fortified, unfermented grape juice that is kept in solera for 4 years and is intensely sweet. 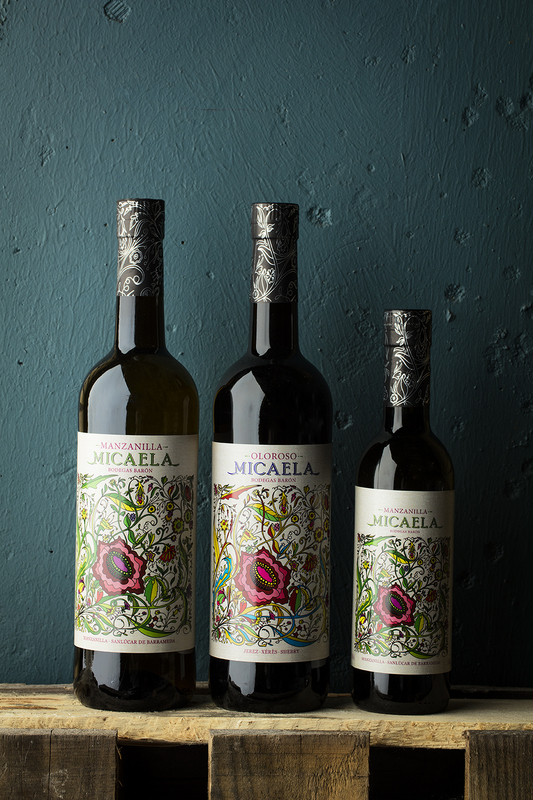 This cream has a sugar level of around 70 grams, which makes a perfectly balanced sweet, but not too sweet wine with nutty aromas, good freshness and a salty, mineral finish. Vinification: Direct press and then fermentation and fortification to 15%, after that it ages under flor in solera for 8 years. Bottled unfiltered ’En Rama’. 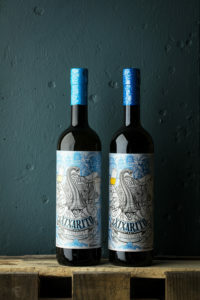 Vinification: Direct press and then fermentation and fortification to 15%, after that it ages in solera as a fino/manzanilla (under flor) for 8 years, before they inoculate again to reach 17,5% and kill of the flor so it gets additional 6 years ageing with oxidation to achieve the perfect balance of both freshness, complexity and depth. Vinification: Direct press and then fermentation and fortification to 17% while there is still a sufficient amount of sugar left. After the fortification it ages in Solera without flor for 15 years to achieve a sweet, complex wine. Vinification: Direct press and then fermentation and fortification to 15%, after that it ages under flor in Solera for 12 years. Bottled unfiltered ’En Rama’. Very elegant, fruit driven Manzanilla with nice roundness and depth.